Fat Angie by E. E. Charlton-Trujillo. Candlewick, 2013. Currently available. Face Value: I appreciate that the girl’s body on this cover is true to the character. Although it would be even nicer to see a real person as the cover model, this cover is well done – it’s clear and bold, and the many elements floating inside the shape of Angie capture the confusion of her current state. I also want to give some positive credit to the book trailer for Fat Angie. It features live actors who actually look like the characters who are described in the story. Does it break the slate? By the end of the book it does, but it takes a while to get there. Angie’s family situation is desolate, to the point when any scenes involving her and her mother are painful to read. I hated those scenes because they represented everything awful about the way women embody societal expectations of appearance and behavior and torture themselves into compliance. Angie gradually pulls herself into a place of better self-esteem and self-image – but she still has a lot of naysayers in her life. The book concludes in a Slatebreaking tone, but it is tenuous. I can only hope that Angie has the strength to continue to be a Slatebreaker. Who would we give it to? The core of Angie’s story is about grief and loss. Readers coping with a traumatic loss may empathize with Angie. It is a dark story, however, and has some potential triggers for self-harmers and those coping with eating disorders. Review: Let’s talk about YA books featuring obese characters. I am curious about the way different types of bodies are portrayed in fiction, which leads me to occasionally pick up books that focus on the physical attributes of a character. For me, this is always an interesting study in how authors describe bodies. Some focus on the external appearance of the character. Others focus on the way the character feels in his or her body. Fat Angie was an interesting blend of these traits. The author did spend a lot of time describing the way other people saw Angie’s body, but Charlton-Trujillo also focuses on the distorted way in which Angie sees herself. Much of that distortion is difficult to read because it is so cruel – but it shows the reader exactly how much trauma Angie has been through. 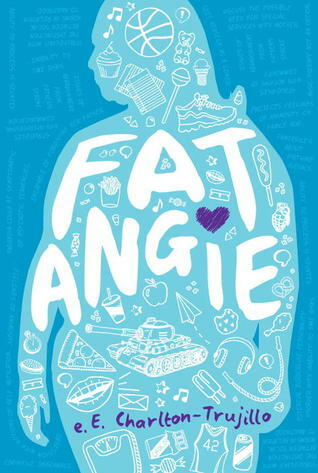 One of the strategies that the author uses to show us how Angie views herself is to constantly refer to the character as Fat Angie throughout the book. It’s relentless, and I found it very difficult to read – mostly because I wanted to author to stop doing that. But the repetitive use of that epithet, even when Angie was referring to herself, drove the point home. Angie has been bullied and cut down for so long that she truly does think of herself that way. Only at the end of the book, when she begins to pull away from that negative mindset, does she refer to herself as just Angie. It was a powerful and uncomfortable way for the author to make a point, but I found it effective. Angie’s story touches on a number of stresses that affect adolescents: bullying at school, split families, body image, strained relationships with parents and siblings, self-harm, and coming out. And although many teen characters in YA deal with one or two of these issues, Angie is dealing with all of them. Plus she is working through her own grief at the loss of her sister. Angie’s sister joined the military and went to fight in Iraq, where she was then kidnapped and held hostage. The media was all over the story. The family meltdown that followed, and the uncertainty of whether or not her sister was alive or dead, sent Angie into a downward spiral. Angie is at absolute rock bottom when the story starts. She makes choices of her own accord that propel her into a stronger, healthier mental and physical state. I loved reading this transformation because it showed that Angie did have the power to change her own situation, no matter how little she believed it. She also falls in love with an amazing and similarly flawed girl, KC Romance. Angie’s friendship and eventual romance with KC is beautiful and rocky and feels so absolutely truthful to how a high school relationship evolves. The author does an amazing job of describing Angie’s emerging awareness of her sexual orientation, and KC is the perfect friend and partner for Angie as they both go through some dark stuff. This book grew on me while I was reading it. It’s not a fun or easy book to read. Angie and KC fight against hurt and pain and cruelty every day, and we have to witness that from the vantage point of a reader who can’t step in to change anything. Thankfully, Angie uncovers the power to change some things on her own. Reviewed from a digital ARC courtesy of the publisher, distributed via NetGalley. This entry was posted in Reviews, Young Adult and tagged Body Image, Iraq war, LGBTQ, weight. Bookmark the permalink.